Avenue 50 Studio & Chicanx Unknown present “Intersectionality.” This exhibition will be held in our Red Floor Gallery. Please join us for the opening reception of the show on Saturday, April 13, from 7-10PM. Light refreshments will be served. Free admission, valet parking available during the opening, or we are located walking distance from the Highland Park Metro Gold Line Station. Intersectionality is a project that explores hybridity. Through photographs, we engage different intersectionality within the Chicanx experience and culture. In the process we celebrate our cultural diversity. 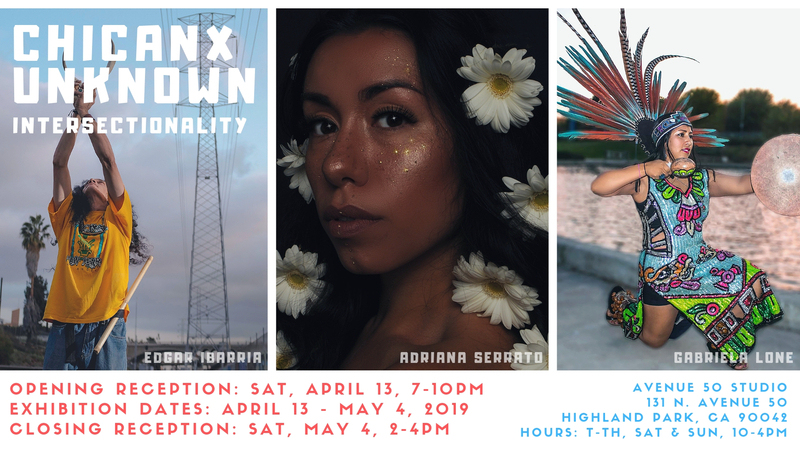 Chicanx Unknown is a collective and photographic concept that explores the cultural and political identity of Chicanos, Chicanas, Chicanx. The actual subject differs from photographers, but fall within a depictive subject, expressive subject, illustrative subject, statement orientated and form-based subject.